This cruise has speed, excitement and hundreds of years of history waiting to be explored. An inspiring mix of full on thrill ride and history at the magnificent Urquhart Castle. All perks of 90 minute tour and some! We are the only RIB (Rigid Inflatable Boat) operator on Loch Ness and our cabin RIB is our pride and joy. Sit on the back and feel the wind in your hair or cozy up inside the heated cabin, however you choose to experience our magnificent loch this will be a day you’ll never forget. Arrive at Urquhart castle in record time, spend an hour or so wandering around the ruined castle and absorbing its fascinating history. 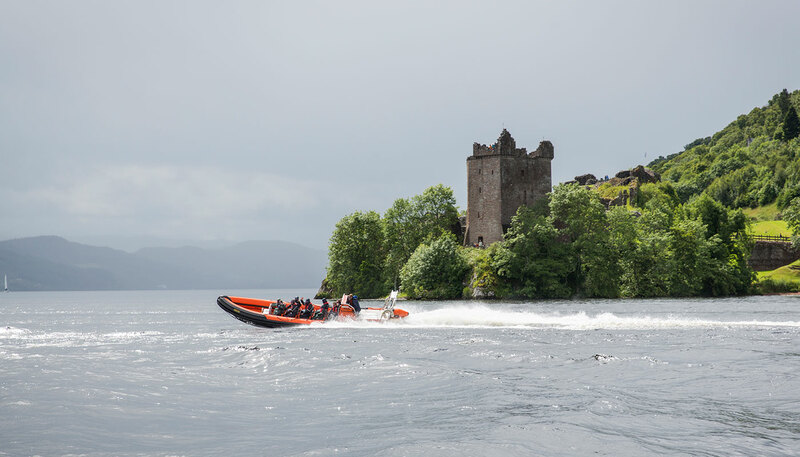 If speed is more your thing, we can zip on by the castle and travel the full length of Loch Ness stopping as frequently, or as infrequently as you like. Due to the length of this tour, we normally prefer to use our luxury Cabin RIB for comfort and convenience (it has leather seats and a loo). If you prefer, just call ahead to check.